Americana Roots Rock done right. Featuring Rami Jaffee on Hammond B3 and Victor Indrizzo on drums, you'll want to take the top down and go for a drive. 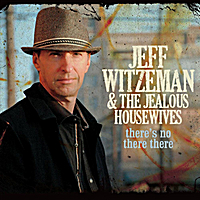 Jeff Witzeman & The Jealous Housewives became the #1 radio played unsigned band in America back in 2001 as tracked by Gavin. Every song off the first album, IN THE MIDDLE OF THE RIDDLE was played on some station somewhere. The second album, OH MY GOD continued the momentum. Lee Larcheveque of WMUA picked the cover of John Lennon’s ‘Isolation,’ as the 13th best song of 2002 ahead of such notables that year as Tori Amos and Mark Knopfler. But just when things looked bleakest, something surprising happened. Music supervisors discovered the songs and used them liberally on TV and Film. With the money accrued, a new project began in the summer of 2011. I loved this album. The album is a fantastic combination of thoughtful lyrics, meticulously crafted music and heartfelt vocals. Its another in a long line of very personal singer-songwriter ruminations on life.